Google Maps lawsuit: Woman follows walking directions, gets hit by car. When Google Maps's walking directions instructed Lauren Rosenberg to walk along a very busy highway with no pedestrian walkway, she followed the directions exactly. Unfortunately, she was hit by a car in the process. Now she's suing Google for damages, Search Engine Land reports. 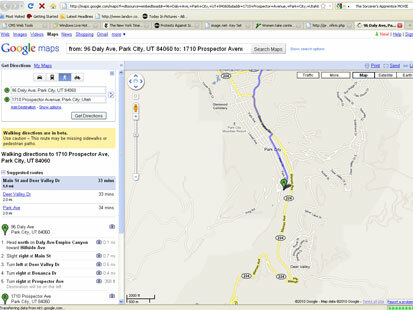 The walking directions from 96 Daly Ave to 1710 Prospector Ave in Park City, Utah told Rosenberg to walk just over one half of a mile along Deer Valley Drive, also known as Highway 224. The highway did not have sidewalks or any other pedestrian-friendly amenities, and Rosenberg was struck by a car driven by a man named Patrick Harwood. Her lawyers claim that Google is liable because it did not warn her that the route would not offer a safe place for a pedestrian to walk. Note that the Google Maps website actually does do that. However, Rosenberg says she used Google Maps on her BlackBerry, which did not show that warning, so she's suing for more than $100,000. She should have probably realized upon arrival that it was an unsafe place to walk, though — but isn't that how these lawsuits always go? If you want to see her Google Maps route, click on to the next page.